The past few weeks has been an interesting time for the Arts in Yale-NUS College. From debates about works labelled as art installations in the lifts, to the sudden appearance of a Stop Sign in front of the library, there has been much conversation about the definition and purpose of art on our campus, and in society at large. To top off this sudden surge in artistic activity was the recently concluded Arts and Humanities Festival. As part of their capstone projects, seniors majoring in Arts and Humanities completed 16 different projects over the past few weeks. This gave the rest of the College the opportunity to be part of a myriad of exhibitions, readings and performances. While a busy schedule prevented me from participating in all the programmes, I came back with a renewed appreciation for the arts in society, and am convinced that what I just saw is the work of the up-and-coming. The first exhibition I visited, was I Carry, a piece by Jevon Chandra ’17. I stepped into a darkened room divided by a string curtain, and was confused by the projection of a crowd of multicolored arrows, swimming in a grey background on the curtain. Behind the curtain was the artist himself, pressing various buttons on his laptop keyboard to trigger the random movement of each of these projections. I was initially confused by what I was witnessing but I gained a deeper appreciation of the project when Chandra explained to me how his actions were in response to the movement of lifts around campus, as reflected by the footage of some metallic device in our school’s control room. I saw I Carry as a reaction, a re-enactment of the arduous yet critical processes that keep our school functioning, a meditation on the invisible forces that keep things running. I would never take our lifts for granted again. 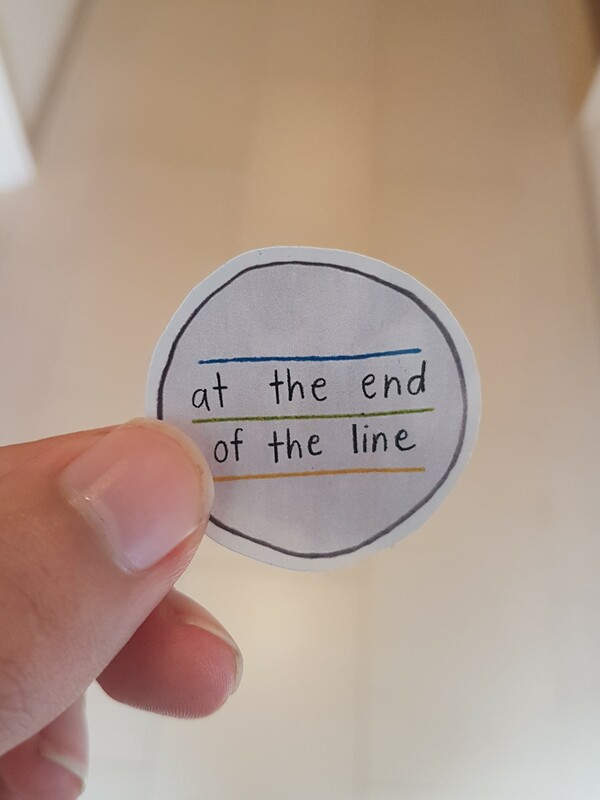 On the similar theme of human relationships, Denise Ng ’17 ‘s At the End of the Line was a picture book and exhibition, exploring the challenging relationship between a sister and her younger brother. The simplicity of this story of separation and reconciliation, coupled with wonderful illustrations that Ng displayed across the walls of the Georgette Chen Art Studio, reminded me of the importance of my own familial relationships. As I left the exhibition, I felt amazed by the works in this festival: their engagement with matters of importance in society with boldness and candor, and yet with a great deal of heartfelt sincerity. The 2 colours, blue and yellow, merge at the end of the line. And indeed, another work that I managed to view in the Festival was one that struck hard at a crucial topic in Singapore today: the issue of meritocracy and streaming in the local education system. The Curve by David Chia ’17 was a participatory exhibition, one that simulated the great differences between the different tracks of Singapore’s education system. The Curve was preceded by an installation outside Café Agora a week before. A TV screen displayed various submitted stories of failure, and viewers were encouraged to submit their own. I was struck by the honesty and similarities between them; many talked about the failure to get internships, the failure to be a model student, and even the failure to care for others. The exhibition also consisted of various articles and pieces of information about Singapore’s education system and its principles of meritocracy. A haunting reflection on the 1987 “Goh Report”, which was instrumental in implementing more rigorous streaming in Singapore’s education system. On the day that I visited The Curve, I remember being placed through a series of simple tests with several other participants, but ones with great importance. I felt a brief pang of shame when I failed the first test, a test of one’s reaction speeds, and was ushered into a different test sequence as the rest. I was ultimately labelled as a “lower-skilled worker”, while the other participants in the room with me all ended up at a “higher” socioeconomic strata. Indeed, The Curve gave me the space to reconsider the role of streaming in our educational system. As I recorded an incident of my failure on a voice recorder at the end of the exhibition, I felt a strange confidence to be more open about my failings to others. To cap off the festival, I visited its final exhibition: An Anatomy of a Home by Sherlyn Goh ’17. I was struck by the apt pairing of physical objects, those mementos from one’s growing years, with heartfelt, bittersweet stories about an individual’s childhood. In spite of the sparse, unornamented nature of the objects presented, I could feel that it was imbued with an authentic sense of nostalgia, a recollection of the past that does hold its own weight. Looking back, the art works presented in the Arts and Humanities festival all differ greatly in their tone, medium and subject matter. However, I found that what reverberated through all of them was the clear, confident voice of an emerging artist, a voice that cannot be ignored, especially in this chaotic world. Indeed, we have here the up-and-coming.